One team's old, stale, dead weight contract, is another's shiny, new... dead weight contract. No? March 3rd is our favorite sports day. To borrow the Puck Daddy's term, it's "Hockey Christmas"! There are a ton of outlets speculating on the names that are likely to move at the NHL trade deadline. Names and reasons are bantered about, but they all seem to focus on the seller motivation and the potential bounty that those deals may yield. However, we want to take a closer look at some of those players and ask what would be the buyers motivation for the transaction. Kovalchuk is the big name potentially on the market. If GM Don Waddell decides that he must be traded, it should trigger a number of deals to reinforce their remaining core. Kovy becomes a UFA after July 1. It has been talked about that his agent is looking for a max contract type deal. He is entering his prime and should be seeking the most money that he can get, while he can get it. However, there maybe three teams, as currently configured under the cap, that could pay max money. Atlanta incidentally is one of them. Kovalchuk is a true sniper, but is not always active as a backchecker. I ask, would you want your team to pay out Ovechkin money for a forward that doesn't score quite as much as the original Ov8, and regularly does not support the defensive side of the ice? ... or furthermore, would you want your team to be forced to clear out other salary to pay him? If the Thrashers are forced to deal Kovalchuk, the sale will be on for any and all upcoming UFAs in Atlanta. Dealing Kovalchuk may be a PR nightmare, but in the long run, it just may be a good thing for the on-ice product. Armstrong and Hedberg both will become free agents after the season and Waddell should be able to get a decent return for either of them. Armstrong is a fierce competitor and a fantastic third liner that can heat up and punch in his fair share of goals, as evidenced by his 22 goals last season. Hedberg has been an ideal backup netminder. Teams looking for insurance policy during the stretch drive could do much worse than the Moose! Hedberg is having an excellent season posting 12 wins, a 2.54 GAA and SV% of .916 and 1 shutout. Both are playoff type players, who come at a nominal cost. 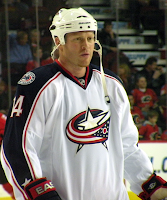 Who doesn't want a hard nosed, gritty playoff veteran that can score in bunches? There is much speculation surrounding Whitney. The rumor is that Carolina is asking for a first round draft pick for this prized rental. It's a steep price, but considering the market that will court the Canes for his services, all it takes is one team, no? Just a few days ago it was thought that the disgruntled J.S. Giguere and Dion Phaneuf would be difficult to move because of their lofty price tags, yet one team took them both on. Whitney will be a hot commodity at the deadline, but giving up a top selection for what could amount to a mid-tier rental winger, may not prove to be a wise choice. Didn't we just mention Toronto? With the Phaneuf and Giguere deals the Leafs may not be in such a hurry to deal Poni, who has been one of the teams more consistent offensive players this season. Yet, if Burke doesn't see a place for him next season, he is a big body winger with decent hands and a very manageable cap number for the rest of the season. If they are still looking to deal, the Leafs will be trying to recoup draft picks expended on Phil Kessel. We don't see Ponikarovsky fetching a first round pick, but he does have considerable value. He is a consistent 20+ goal scorer who seems to improve a bit each season, he is not afraid to shoot the puck and plays a decent defensive game as well. Note the fact that he is one of the few Leaf forwards with a plus rating... honestly it says a lot considering how badly Toronto has been outscored this season. Nearly ten years his junior, Poni is a better trade value than the more highly touted Ray Whitney. Visnovsky has a $6.5 million cap hit and has not been the same since his seperated shoulder and subsequent surgery to repair his labrum. What more needs to be said? Two years ago he was an asset as a goal scorer in L.A., but after his shoulder boo boo, he scored only eight times last season and although he has nine more thus far this season, his salary is atrocious! Why take on someone else's money pit? (see Scott Gomez) To his credit Visnovsky is responsible in his own end. He is one of the very few Edmonton players with a plus rating, which is a stellar mark on this awful defensive club. What could be said of Souray is almost a repeat of his teammate Visnovsky. He has a $5.4 million cap number. However, after suffering through an injury marred '07-'08 campaign, he had a big time season last year, but has struggled mightily this season. Unlike Visnovsky, Souray is a liability in his own end, but bringing hulking size and a pure cannon of a shot. Again, we wouldn't want to do Edmonton any favors and take on another overpriced blueliner, unless a team was confident enough that they could surround him with others who could make up for his defensive indiscretions and had plenty of room under the cap... can you say New Jersey or bust? Just two seasons ago Turco was willing his team to the Conference Finals. 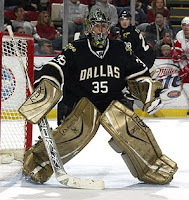 Back then his unorthodox style and fashion conscience masks were endearing to the Dallas faithful. Yet, after a disastrous season last year, and only marginally better this season, the Stars do not seem to have much use for him any longer. He has been benched in favor of Alex Auld lately. Turco becomes an UFA on July 1 and could be had on the cheap. At this point, he would be a low risk addition to any club seeking a strong backup for the stretch run. 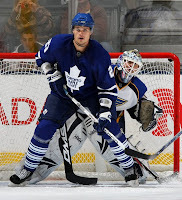 Additionally a change of venue could be just what Turco needs to rediscover his knack. Columbus is mired in a very disappointing season and will be motivated to move one of their few tradable upcoming UFA commodities in Torres. After showing some serious promise early on with Edmonton, Torres has dealt with numerous injury problems and has not been able to recapture his former scoring touch. By Blue Jacket standards, he is having a decent season, although he did spend some time out of the lineup again due to injury. He has a relatively small cap number the rest of the way and he could be of some help to a legit contender in need of a power type winger. He is a classic boom or bust rental, that should not cost all that much to obtain. Although there has been much talk about Halak being moved, why would the Canadiens trade away their best goaltender? he has thoroughly outplayed Carey Price this season. We predict that he will be traded in a multi-player deal well before the deadline to Toronto. Kidding, just seeing if you were paying attention! to Toronto also! see Phaneuf above. All part of the anticipated Carolina fire sale. Cullen and Walker are hard working forwards with plenty of playoff experience. The Canes really like what they have seen from young blueliner Brett Carson and would like to give an extended look before he becomes a RFA. Moving Alberts, who has one year remaining on his deal would be a logical choice, as he is very affordable and defensively sound, which will attract more than a few buyers at the deadline. Don't forget Vinnie Lecavalier because, well, he is always talked about! Note to the Lightning: Trade him before other teams discover that he "just don't got it anymore!"